This summer, New Mexicans were exposed to intense rainfall during the monsoon. However, climate projections across the United States suggest that even as total annual precipitation decreases in places like the Southwest, the heaviest annual rainfall events may become more intense (Walsh et al. 2014). When heavier precipitation falls on drought-hardened or wildfire-transformed soil, which has a reduced ability to absorb moisture, more of the water runs off into streams instead of percolating into the ground. Such extreme events are projected to become more common, forcing communities to prepare for both extreme droughts and extreme floods. Flash floods can occur with little or no warning, move at very fast speeds and can reach a peak in a few minutes. They can roll rocks, tear out trees, sweep away cars and trucks, and destroy buildings and bridges. Rapidly rising water can reach heights of 30 feet or more. Flash flood-producing rains can also trigger catastrophic mudslides. You will not always have a warning that these deadly, sudden floods are coming. Most flood deaths are due to flash floods, and most fatalities occur in vehicles. Acequia farmers and ranchers across the state, for many of whom acequia is their only non-rain form of irrigation, the effects of the drought were devastating for some. Yet, when the rains came it devastated crops, culverts, diversion dams and filled the ditches with silt. Many acequias had reduced flows leading to shortened irrigation seasons, priority being given to gardens – meaning that pastures might not get irrigated, long gaps in the availability of water – this translated in to many farmers reducing their plantings and not doing regular succession plantings – threatening both their livelihood and local food security. Acequias may be eligible for emergency funding available for recovery and repairs resulting from the recent flooding. 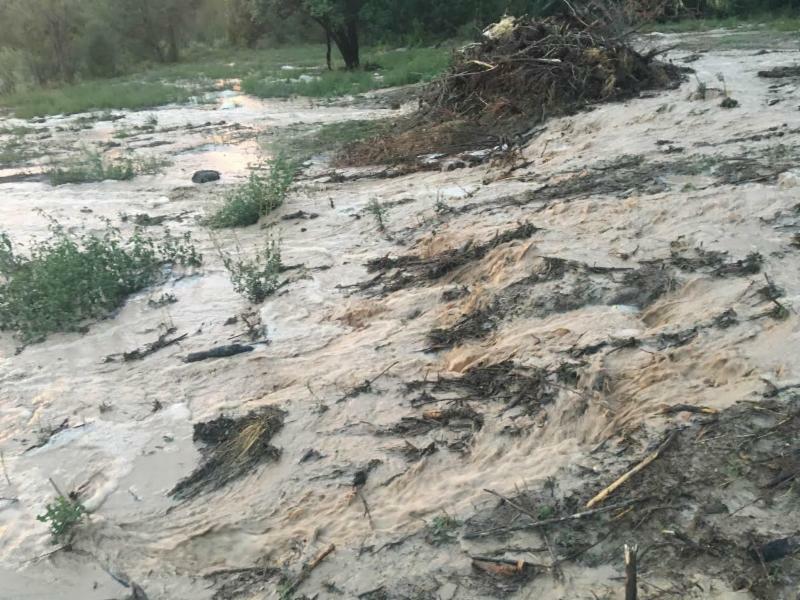 Acequias officials should communicate with the emergency manager from their county as soon as possible to let them know the extent of the damage to their acequia. And contact your local the FSA county office. On August 20th 2016 El Rincon Farms was hit by a massive flood sending each family member outside with a shovel to re-direct the water and mostly protect their homes and crops. The Acequia de la Cañada Ancha runs right through our front yard and our property. At least once a year we experience flooding that teaches us where the weaknesses are. We usually go and fix those weaknesses, but the next year Mother Nature will show you what you need to fix next. Last week on August 22nd a violent 30-minute thunder and hail storm produced the worst flooding I've ever seen. 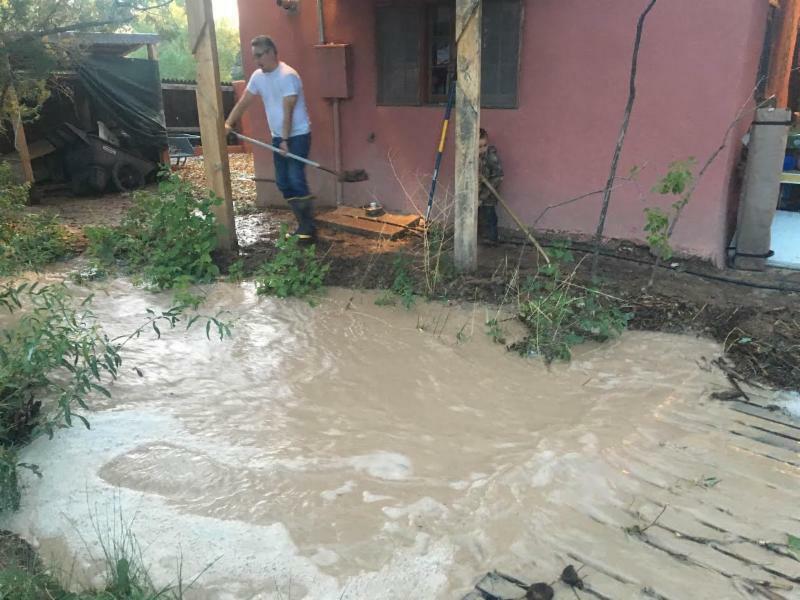 The acequia was so full that it broke in at least 10 different places, nine of them where it had never broken before, and two of them right next to the house. I am thankful that our houses did not get flooded, but it looks like every year the water gets closer and closer. I planted a small patch of grass in the spring for my two little boys to play on and a good sized chunk of it got flooded and covered in silt. The acequia broke at the neighbor's foot bridge so bad that it looked like a new acequia running through our property, and it roared through our property and over the leach field for our septic tank for 12 hours. Besides that, it completely flooded our corn and chile fields to the point of irreversible damage to the crops. Besides the flooding on our property and on the properties of our neighbors, our acequia itself is broken and has no water in it. This is the 5th time that our acequia has broken in the past 3 months. The parciantes get tired of fixing it or sending peones to help and they ignore the mayordomo's phone calls to coordinate the labor. We have retention dams that are supposed to empty into the arroyos but they dump storm water and silt into our acequia instead. We are trying to work with the proper authorities to get that changed, but now people have put their mobile homes so close to the arroyos that when they run, their own homes are at risk. The weather patterns seem to have changed and we have a few spots where it now breaks every time there's a heavy rain because the arroyo runs into the acequia and fills it up with sand, and we have to go and dig it out over and over again. We need a long term fix for these problems and we are told that we are on the top of the list for engineering services and funding, but we don't seem to get anywhere. There are many issues to resolve and not enough money or manpower to get them done. Back in the day when our people relied on the acequia to survive, they would come together to fix things as many times as it takes to make sure we get the water where it needs to go. But in this day and age, our acequia is not used for survival and it has become more and more neglected, and the problems it develops are harder and harder to fix.